If you are like many homeowners, you may not pay much attention to your garage door as long as it seems to be working well and is not causing your family any problems. However, it is very important to know the signs that your existing garage door is potentially hazardous to your family. Read on to learn about four signs your existing garage door or its components are dangerous so you can take steps to have your door repaired or replaced to keep your family safer. If you have a garage door opener that was manufactured before 1993, then it may not be equipped with an important safety device now required by the CPSC, or Consumer Product Safety Commission, in all garage doors manufactured during and after that year. This feature is an automatic reverse function (also called an external entrapment protection system) that causes the door to stop closing and begin opening if someone were to step under it or an object is detected in its path by special sensors. However, even if you have a door opener that has these sensors, garage door opener technology has come a long way in recent years, and many new openers have features that make it more difficult for intruders to break into your garage. For example, many of today’s new garage door openers are equipped with rolling code technology. This technology resets your garage door code every time you operate it, which can keep burglars with hi-tech equipment called “code grabbers” from hacking into your garage door opener and opening it with just the push of a button. It is important to inspect your garage door springs often to ensure they are in good condition. If you see signs of wear, such as rust, corrosion, or gaps in the springs, then those are signs that you should have them replaced by a professional. Garage door springs are under a lot of tension, and if one were to “snap” on its own due to wear and tear, it could cause serious injury. Don’t try to replace worn garage door springs on your own, because even the act of replacing these springs is dangerous. Always contact an experienced professional any time you notice garage door spring wear to have them replaced ASAP. There are two types of garage door springs: extension springs and torsion springs. If your garage door is equipped with extension springs, then it is very important to ensure your door is also equipped with safety cables. Safety cables help ensure that if an extension spring were to break, it would not project through the air with extreme force and cause serious injury. If you notice signs that your garage door is unbalanced, then this is not just a nuisance, but a hazard to your family. 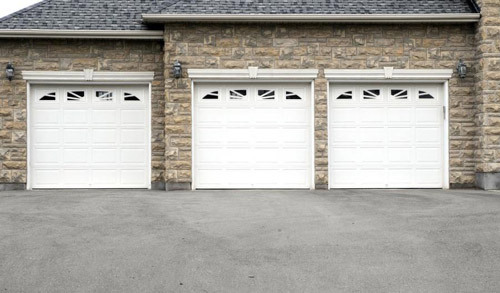 Not only can an unbalanced garage door in the “open” position come crashing down at virtually any time, but unbalanced doors can close unevenly and leave a gap between the door and the ground; this can lead to them being broken into much more easily than balanced garage doors. Common signs of an unbalanced garage door include a door that leans to one side, that is difficult to open and close, or that simply will not open with your door opener. An unbalanced door can cause wear and tear on your entire garage door system, including your door opener, tracks, and other parts. This makes it important to have an unbalanced garage door repaired as quickly as possible before it harms your family or the rest of your garage door system. If you notice any of these signs that your garage door is hazardous to your family, then contact Premier Door Corp for expert advice and garage door repair or replacement.